Age 24 of Durand passed away Saturday, April 6, 2019. Funeral Services will be held 12:00 pm Wednesday, April 10, 2019 at Nelson-House Funeral Home with Pastor Joey Teceno officiating. Burial will follow at Hillcrest Memorial Gardens. The family will receive friends at the funeral home on Tuesday from 5:00 pm to 8:00 pm. 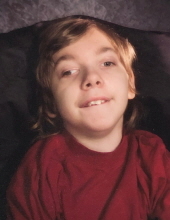 Shane was born February 3, 1995 in Lansing, the son of Tod and Kimberly (Brown) Dodge. He will be remembered by his loved ones for his good nature which brought his family a sense of happiness and joy. Shane is survived by his parents; brothers Sean Alchin and Shannon Dodge; grandparents Robert and Marcia Brown, Janet Tkaczyk and Wanda Dodge; special aunt Tammy Brown; several aunts, uncles, cousins and other loving family and friends. He was predeceased by his grandfathers Jesse Dodge and Robert Tkaczyk. To send flowers or a remembrance gift to the family of Shane Michel Dodge, please visit our Tribute Store. "Email Address" would like to share the life celebration of Shane Michel Dodge. Click on the "link" to go to share a favorite memory or leave a condolence message for the family.